Almost 700 pages of lean, practical, low fat, low cholesterol content to help you get productive in minutes. Coding tips and tricks which you will not find anywhere else. Uses only standard cURL and JSON to make it easy for you to understand and work with the API. Explains the basics of configuring your web-app in the Google API Console. Takes you through the process of OAuth authentication. 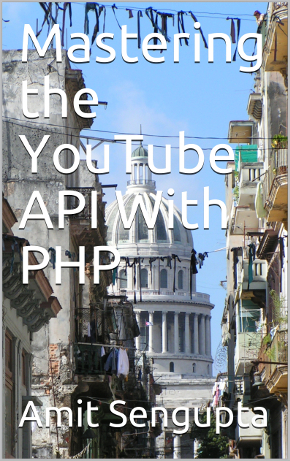 Provides all the supporting reference documentation you will need to create YouTube API based applications. No marketing hype, no sales pitch. This is actually an offer which you have no reason to say no to. Just fill up the form here and you will get the download link via email.